A frequent first impression when opening the doors to Casa Diamante is “wow.” With an unobstructed view from front to back, an open air pool in the middle of the house, high ceilings, and adobe walls - Casa Diamante is colonial living at its finest. Take a two block walk and you find yourself in the heart of Granada's bustling restaurants, parks and historic district. Yet Casa Diamante is located in a residential neighborhood with little traffic. Great for families, couples and small groups. The rooms on the first floor are spacious, with plenty of natural light and ventilation, and have their own large bathrooms. The master suite on the second floor is huge and truly spectacular, with two breezy terraces on both sides and glimpses of Volcan Mombacho and the cathedral. The fully-equipped kitchen is spacious and open, with a breakfast bar and stools. All bedrooms have queen beds, fan, indirect, warm lighting, and high pressure, hot water, and washer / dryer. We offer covered, safe parking less than one block from the home. 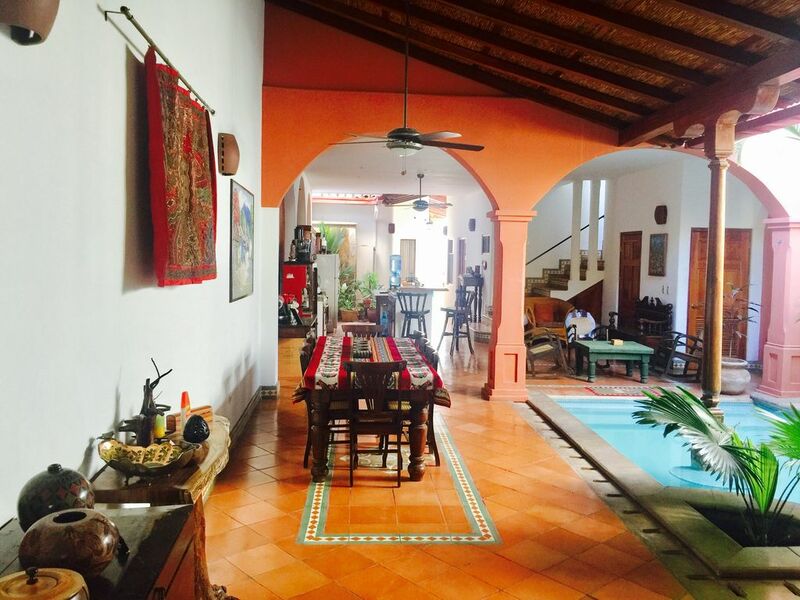 Location in Granada is important, and Casa Diamante does not disappoint. Its location offers proximity, peace and quiet, and an authentic Granada experience. The home is located on the famous Calle Cuiscoma, one of only two of the first pre-colonial settlements of the first indigenous groups to inhabit Granada. Take a four minute, two block walk and you find yourself in the heart of the famous Calzada street’s bustling restaurants and bars. Central park is three and half blocks (7 minute walk), and the lake a 10-15 minute, seven block walk or easy bike ride. Yet Casa Diamante is located in a residential, non-commercial neighborhood with little traffic. The block offers the feel of an authentic Granada neighborhood, with neighbors swinging their doors wide open in the evening, sitting in their rocking chairs, and kids playing in the streets. We make every effort to pamper our guests at Casa Diamante. You will be greeted with a fruit basket and a bag of our family-owned single origin, Estate grown organic coffee. All beds have Sleep Innovations foam pillows that custom shape to your head and neck. Bathrooms have thick, soft towels and hot water from a real water heater (no electric shower heads). California-born, 20-year resident of Nicaragua. Farmer, writer, entrepreneur. Secure, covered parking one block away. salt and pepper, cooking oil. Seating for 8 people, huge dining table. We hope to do this again sometime in the near future. Loved our stay at Casa Diamante in Granada! It is in a perfect location, within a couple of blocks of all the action on the "Calzada" and close walking distance to the lakefront. The house layout is perfect and a wonderful space to relax and enjoy the city! The pool in the center courtyard is a unique bonus and makes it easy to stay cool! The second story room is an excellent addition to the house - with a couple of terraces for sitting out and taking in the Nicaraguan breeze and rooftop views. All this with a taste of wonderful locally grown coffee provided by the house owner makes this a repeatable getaway spot! It was great to host you and your family. We will welcome you back anytime.